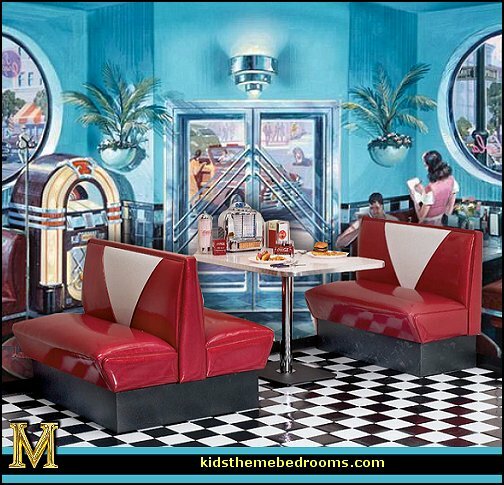 Create your own old fashioned diner experience with 1950s and 1960s style kitchen diner booth seating. 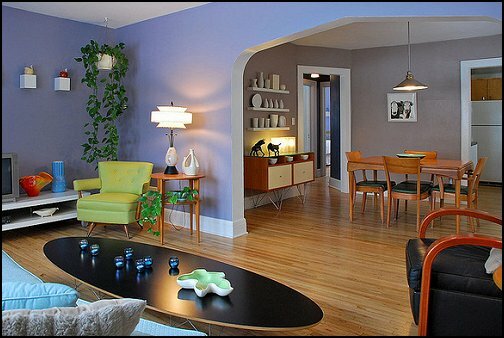 Customize the laminate and colors to your own retro decor. 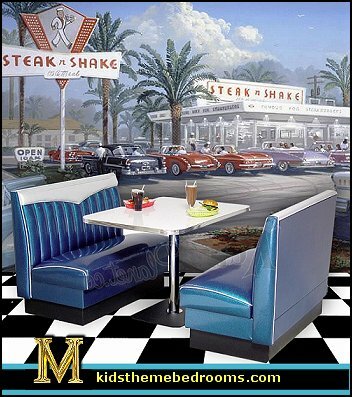 Choose from Classic V-Back, Mod, Chevie, Elite and Serenade Booth & Pedestal Table Sets. 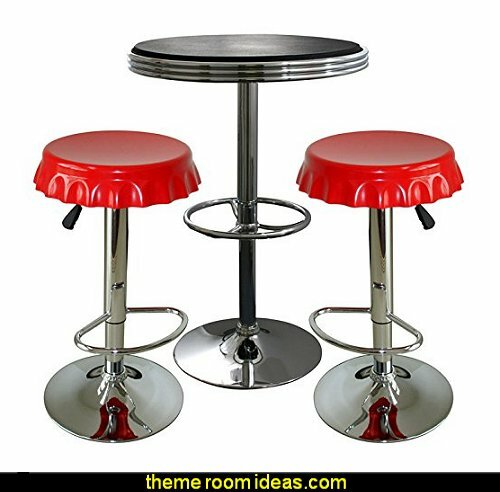 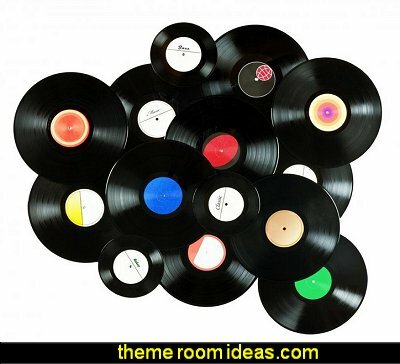 A great retro look for your dining room, kitchen, game room, or even diner restaurant. 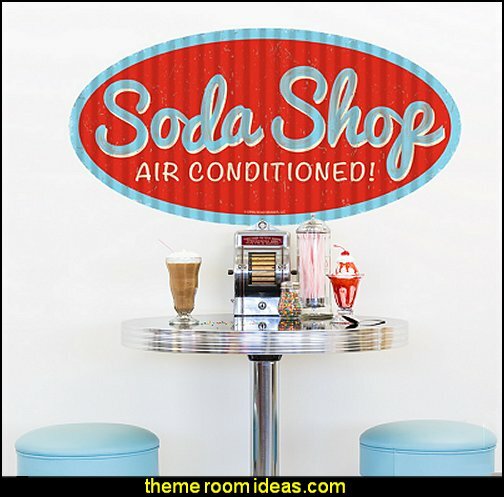 Add a dash of retro decor to any room quickly and easily with our removable wall decals! 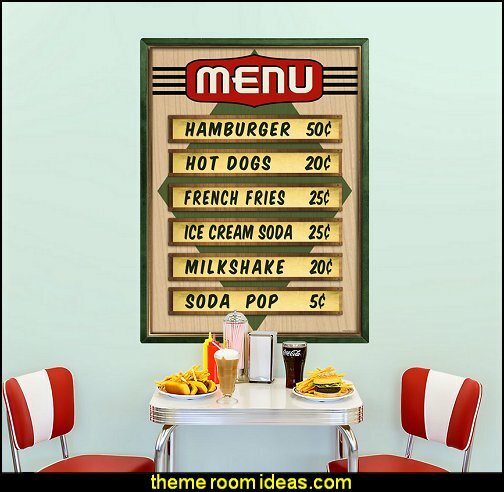 This removable wall sticker captures the look of an old-time diner menu board in a peel-and-stick decal that won't leave holes in the walls. 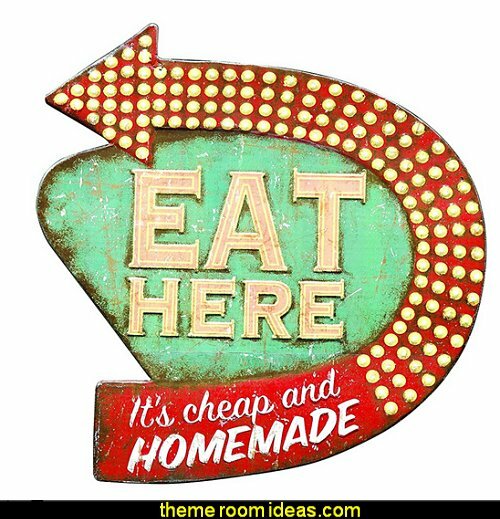 A fun alternative to signs, this wall graphic is brimming with vintage style and makes a great decorating idea for a retro kitchen or dining room. 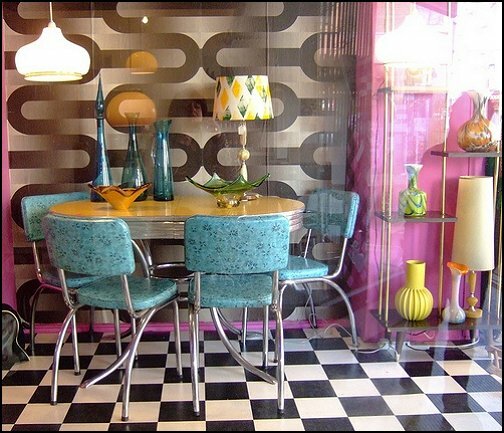 50s design recalls the wonders of boomerang-shaped coffee tables, the funky curvaceous furniture, the industrial sleekness of cool metals, rock-n-roll and twist and shout, flashy hot rods, pink poodles and soda shop and retro diners. 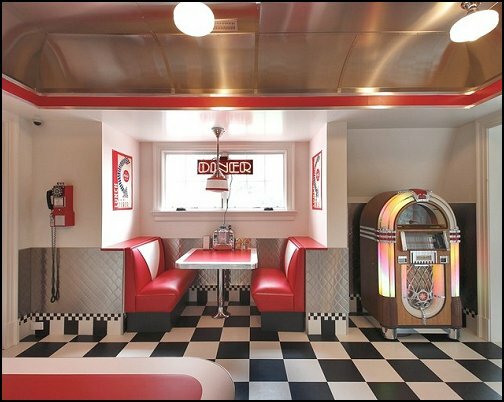 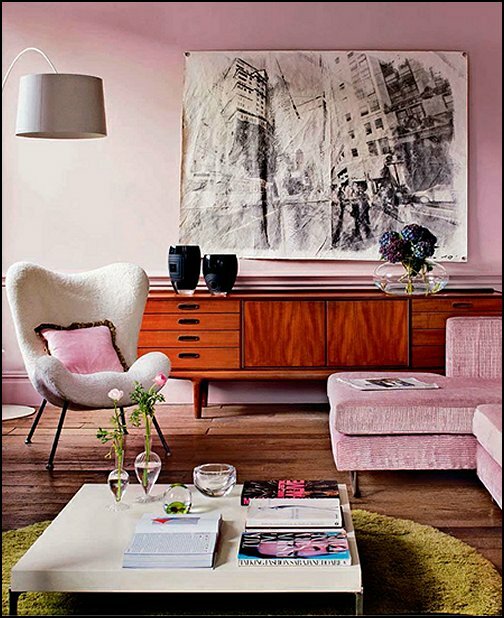 So get creative, and design your own unique nostalgic look at home, whether it be authentic 50s style or fun and creative 50s style. 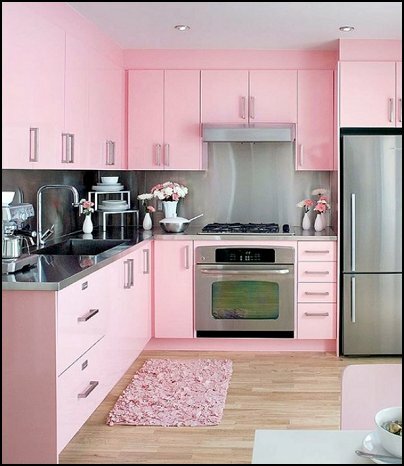 Just have fun with it. 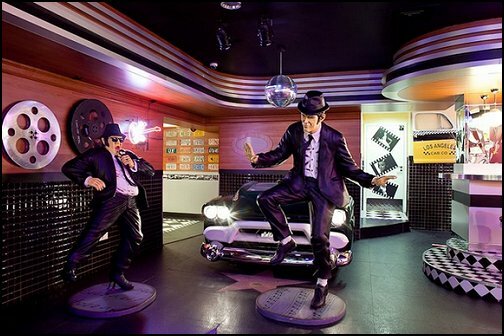 Nothing says 1950s like records, so dust off those ol 45s and step back in time to the days of rock and roll. 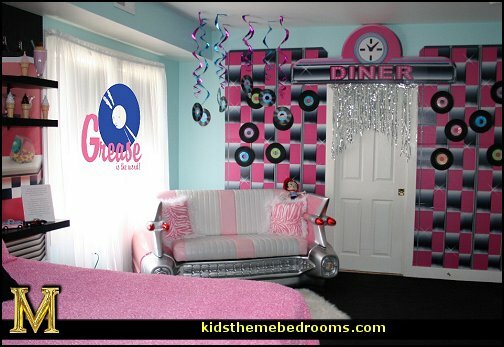 When a classic car has seemingly crashed into your wall, the only thing to do is make it a part of your decor! 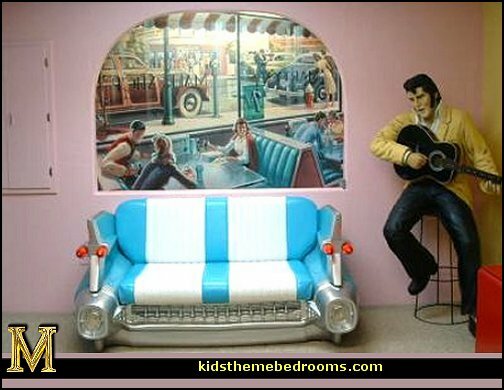 Display your treasured collectibles on this 1959 Cadillac Wall Shelf. 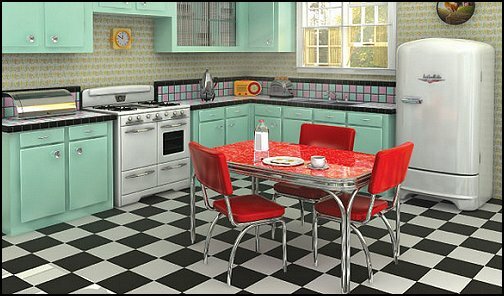 The 1950s was the first great age of the modern kitchen: labor-saving appliances, bright colors and the novelty of fitted units moved the kitchen from dankness into light, where it became the domain of the happy housewife and the heart of the home. 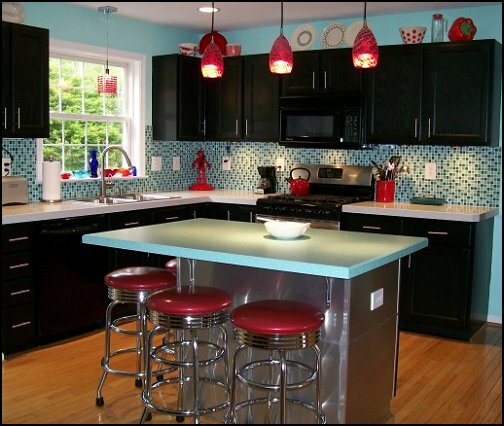 Formica - a new space-age material - decorated with fashionable patterns topped sleek cupboards. 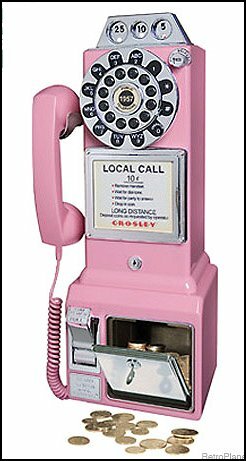 Everything is pretty in pink - including this retro-styled pay phone. 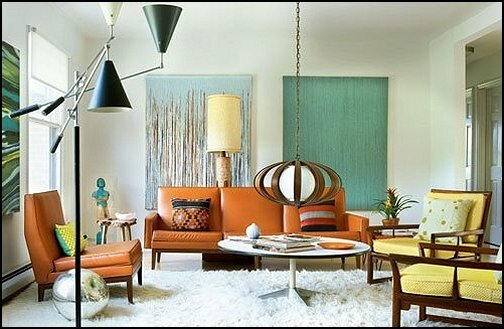 Mid 20th century design is back in a big way with this high-tech phone. 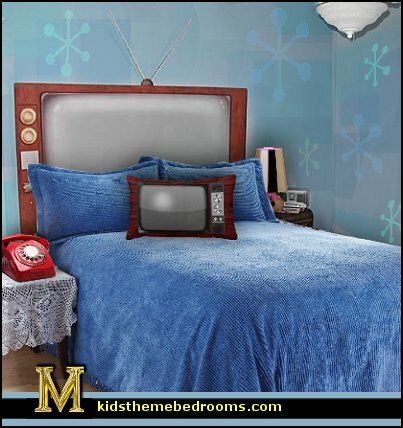 Pattered after classic rotary phones, your model has push button convenience, an 11-foot cord and even a coin bank! 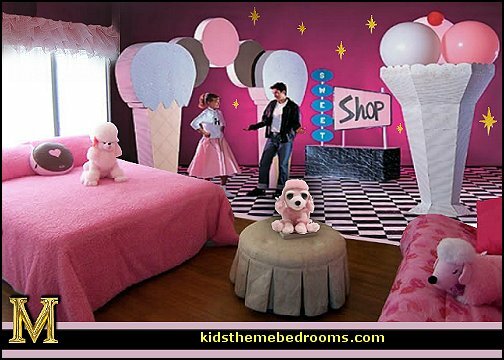 What a fun way to reach out and touch someone! 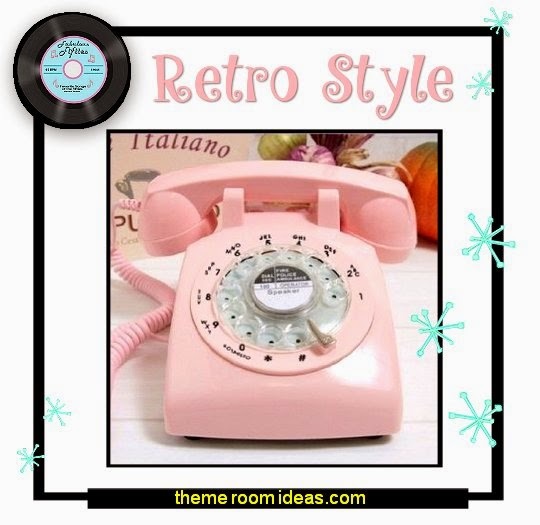 This classical designed phone will take you way back into time when phone numbers were only 4 digits long. 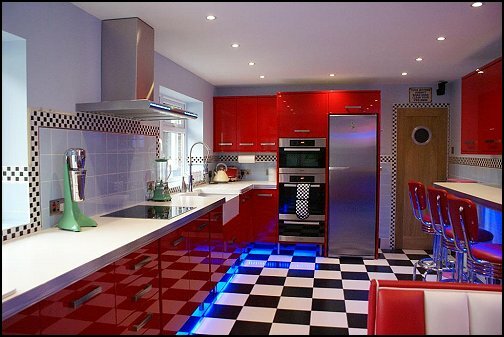 Electricity entered the kitchens of millions, and nowhere in the home was modern technology and modern design more evident. 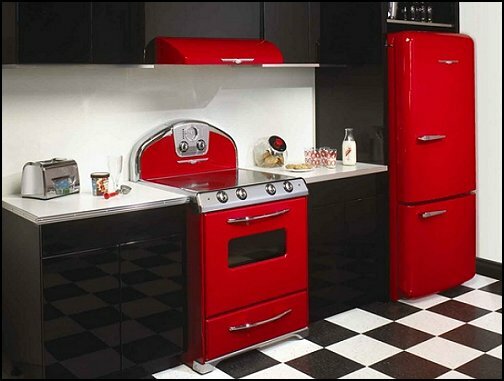 Bold color, clean lines and stainless steel were keynotes of the decade, and it is no surprise that 1950s kitchen style is now the height of fashion once again, with names like Cath Kidston picking up on the best of '50s kitchen kitsch, and manufacturers like Dualit, Kitchen Aid and Aga doing healthy business with retro appliances. 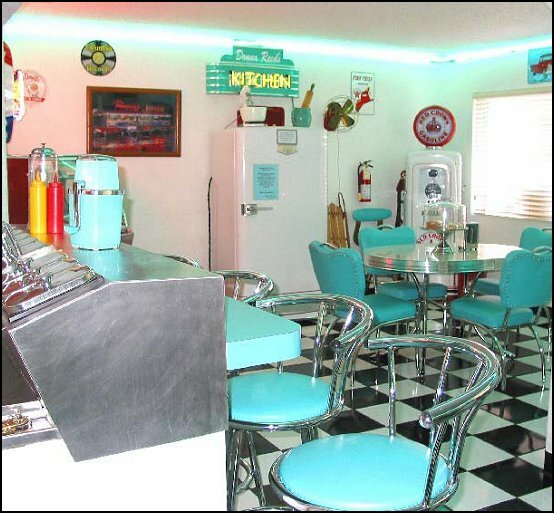 The diner - more than just a place to grab a bite, the diner is an expression of the free-flowing American spirit, as generous as a bottomless cup of coffee and a flashing neon sign beckoning the traveler or passer-by with the immortal words "Eat Here Now." 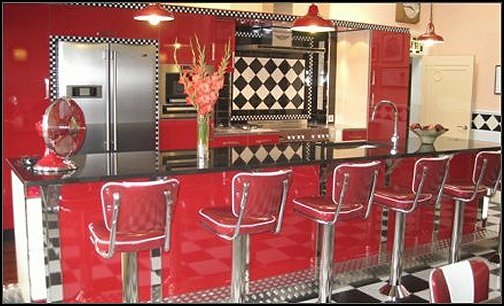 Chrome counter stools and rollicking juke boxes. 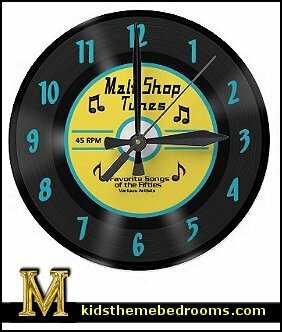 This retro wall clock features a vintage 45 record with Malt Shop Tunes in yellow and blue. 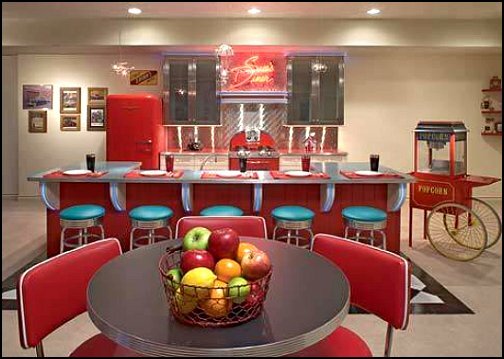 Chrome and neon were the new currency in this newly vital consumer culture, and no post-war consumer products trafficked more heavily in this currency than diners, bowling alleys, and trailer parks. 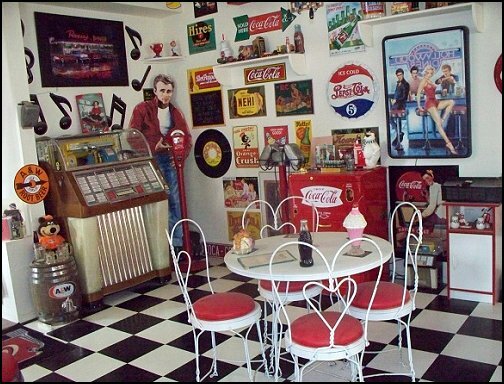 Black and white says "fifties"! 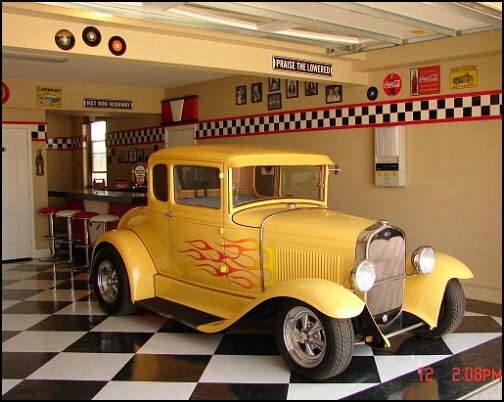 The drive-in was once a classic expression of car culture and remains a fixture in the memory of the first baby boomers. 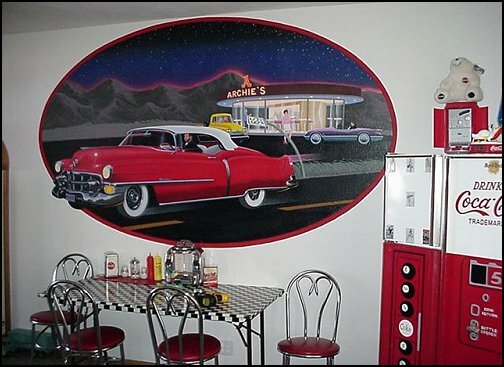 Variety of retro wall murals, vintage murals such as retro diner scenes or old vintage car murals in Retro and vintage wall murals section. 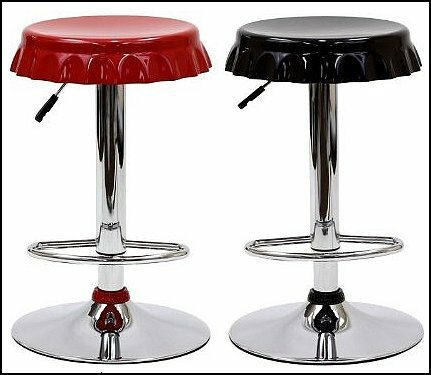 The Soda Bottle Bar Stool is sure to draw praise. 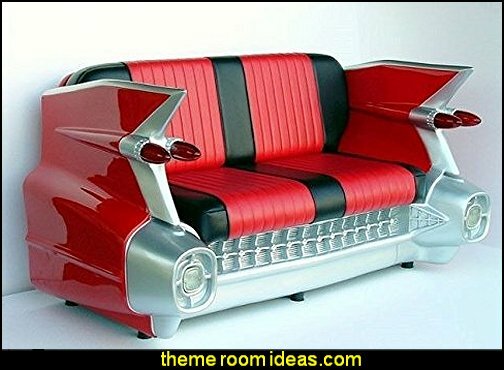 What a delight to sit on such a fun piece of furniture. 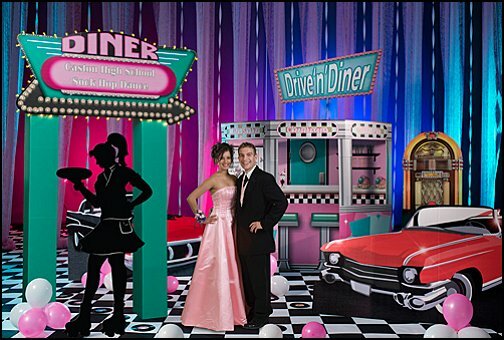 Stand ups are life size cut-outs designed to decorate any room or party. 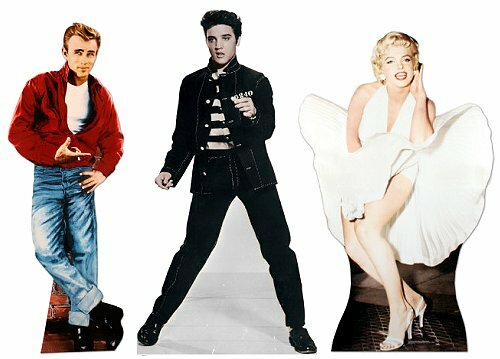 Each stand up can be mounted to a wall or door, or can stand by itself. 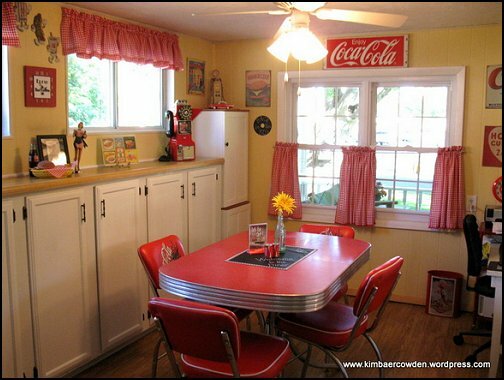 This is an exact replica of the famous Westinghouse Junior Coke Machine that was so popular in the "Mom and Pop" stores of the 1930s and 40s. 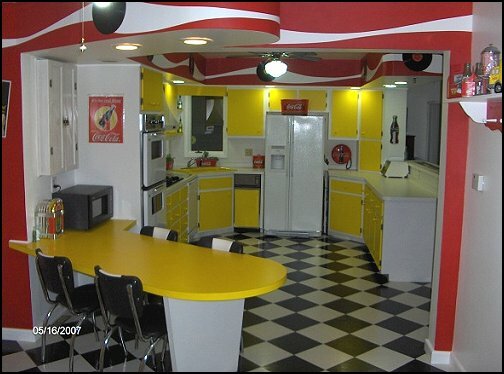 This self-serve cooler will be quite a conversation piece at your home or office! 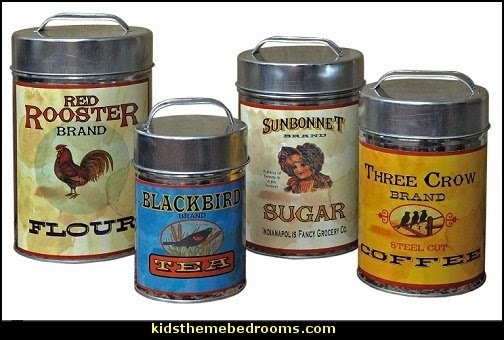 It enjoys an all-metal construction with embossing on all sides and under the lid, like the original. 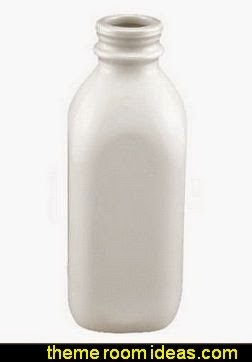 Don't miss the bottle opener detail on the outside, either. 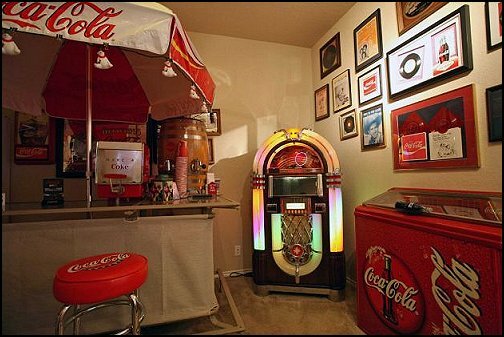 This original machine was made entirely for Coca-Cola, and no other brands were used. 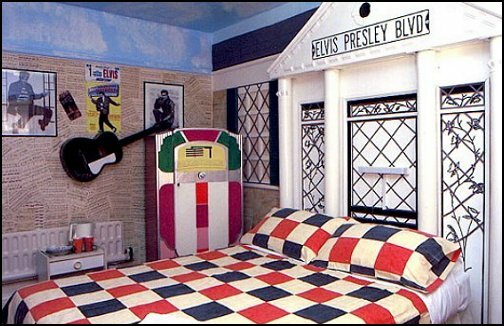 One of the attractions of this machine is its beautiful embossing. 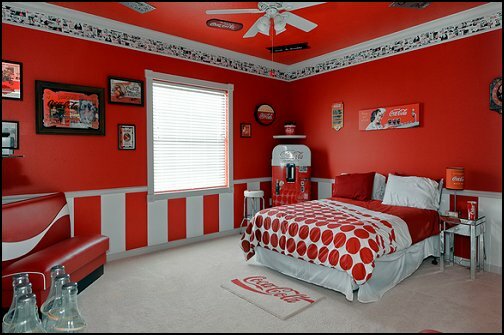 The cooler has the Coca-Cola logo on all four sides as well as under the lid so it could be read when the top was opened. 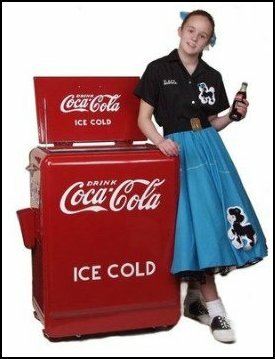 Additionally, it has "ICE COLD" embossed on the front and back. 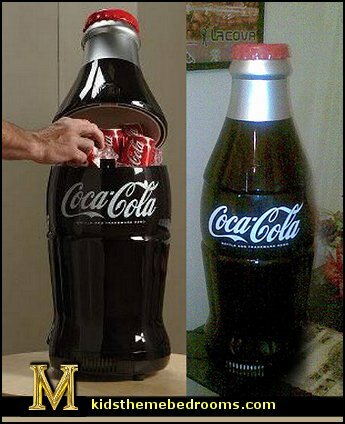 You open the lid and you have a deep box to place cans, bottles or anything else you want to keep cool. 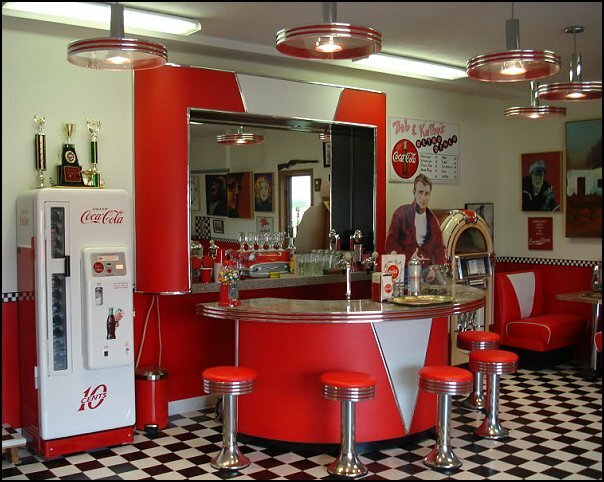 This machine will hold 80 cans of soda. 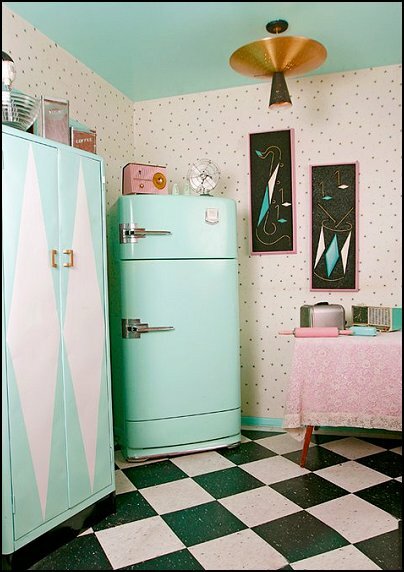 If you have the refrigeration model you even have more room for something else on top. 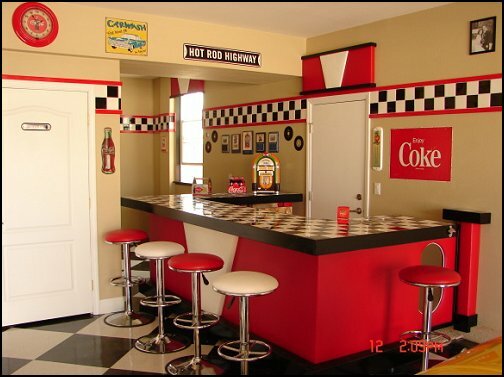 This cool Coke ® bottle mini fridge adds a touch of iconic Coca-Cola ® style to your home or office. 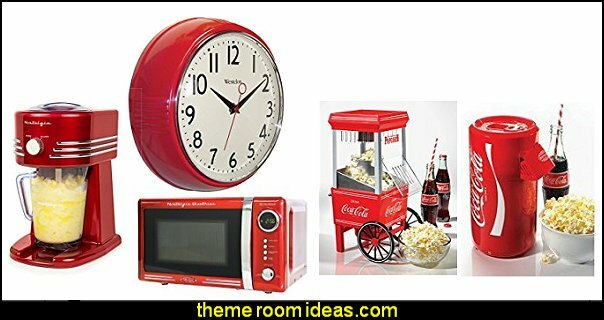 A unique addition to any room and great for small spaces, this personal thermoelectric refrigerator holds up to fifteen twelve-ounce Coke ® cans and keeps them at 32 degrees below ambient temperature. 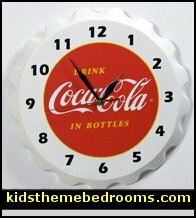 A great gift for any Coke ® fan! 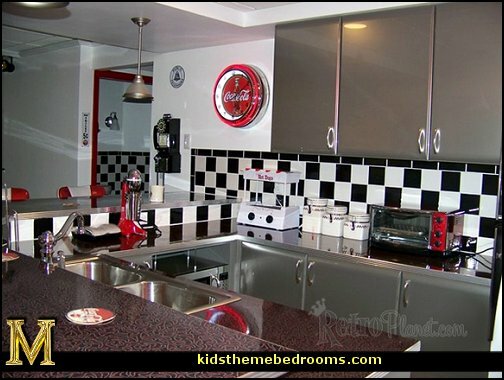 This Vintage Style Kitchen Scale helps make your kitchen look just like grandma's! 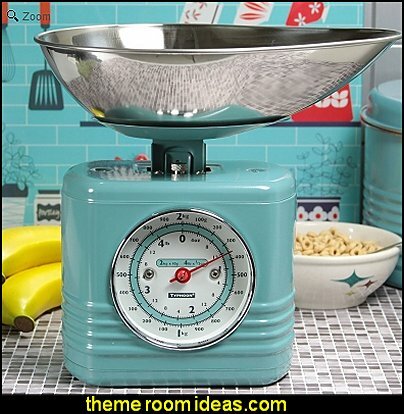 A handy way to weigh foodstuffs for recipes or diets, this retro scale looks great displayed on a countertop. 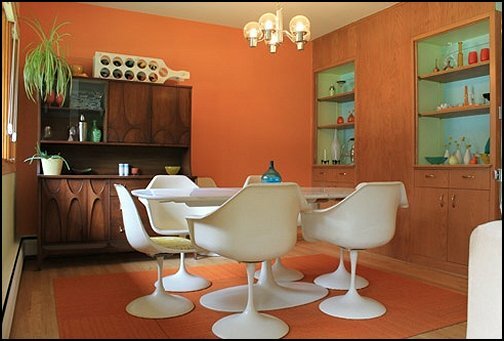 Sturdy steel construction and blue-enameled body support a pear-shaped, stainless steel bowl that's easy to pour from. 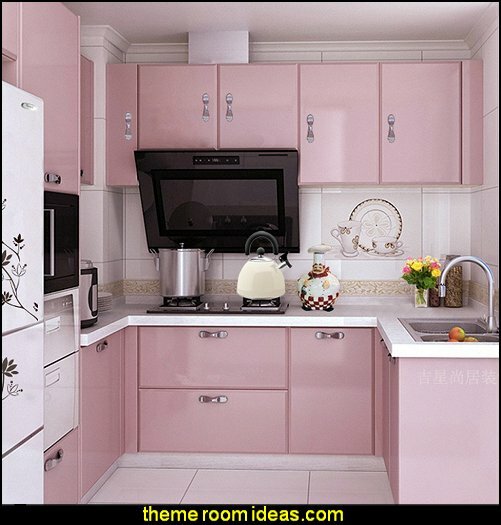 A wonderful way to spruce up any your kitchen decor. 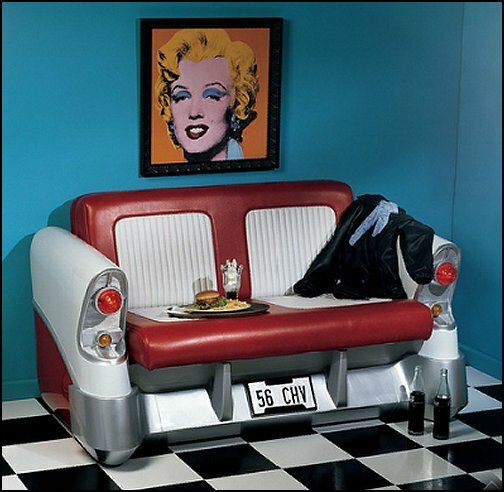 This Pop Art cruiser is an invitation to park yourself in '56 retro style in the back seat this near-full-size, Candy-Apple-Red-n-White sofa that celebrates the art of car design! 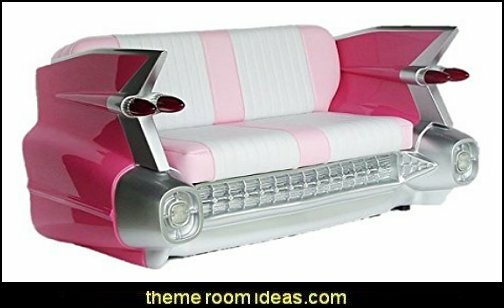 From her rounded rear fins to her heavyweight, faux leather cushioned upholstery, she’s a timeless, not-to-be-missed style statement for any room. 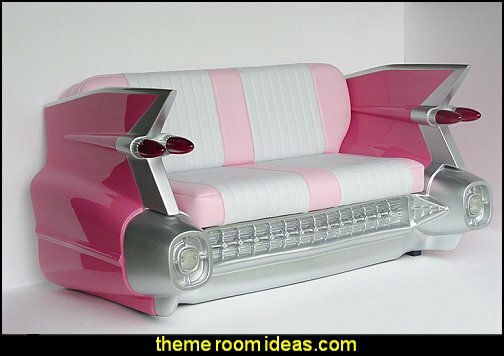 No matter who is seated side-by-side, the brake lights actually shine—so she’s always ready to peel rubber! 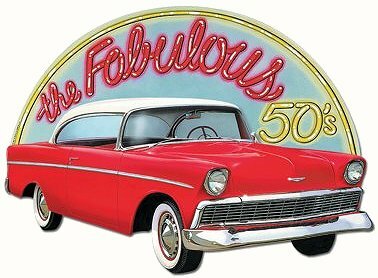 Cruise down Route 66 in your classic 1953 Studebaker. 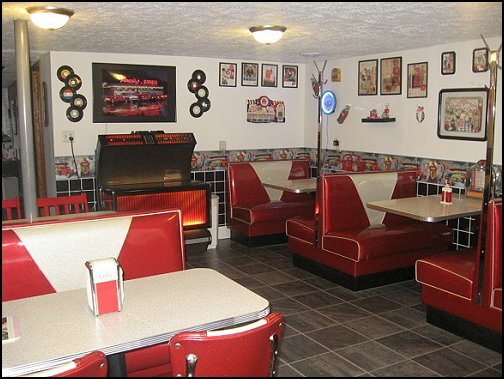 Stop at one of the diners along the way. 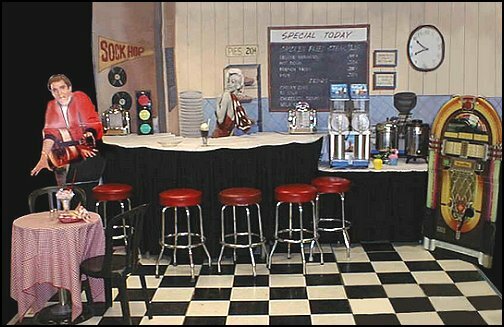 There's got to be one somewhere called the Dixie Diner. 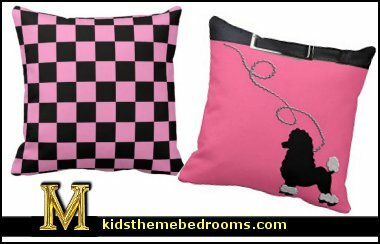 Pink and Black Checker Pillow Retro 50's look and replica of a 1950 poodle skirt, with the belt and everything! 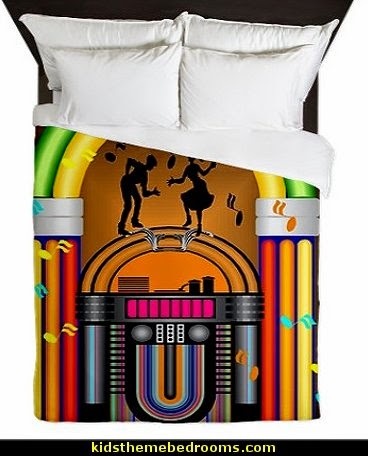 This product is truly unique and sure to be a conversation piece. This beautiful retro wall clock features a 45 record featuring the fabulous 1950's in pink and blue. 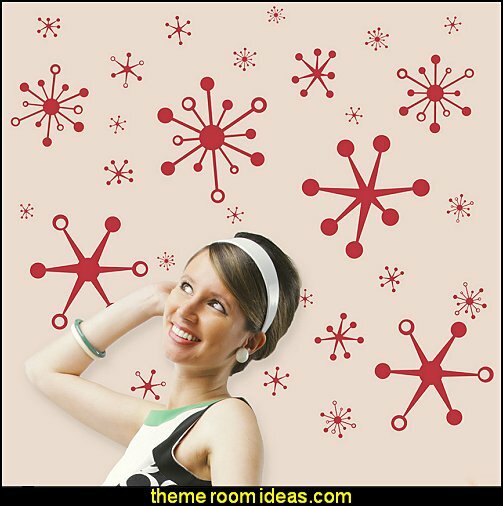 Add some retro style to the walls in your home with Retro Starburst Wall Decals. 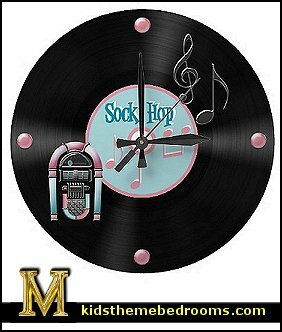 In the 1950’s, television was becoming more and more a part of everyday life, more families had televisions in their homes and AM radio was also becoming more popular, along with the advent of 45 records, jukeboxes, and eventually albums. 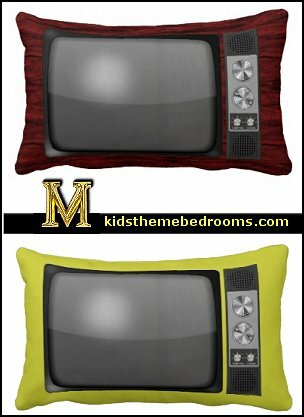 Retro vintage style TV set with chrome knobs and wooden case. 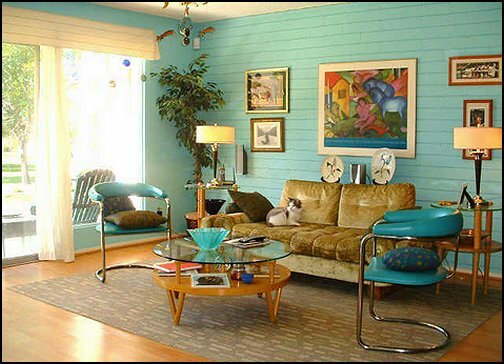 Retro look wallpaper of the past updated for today's homes. 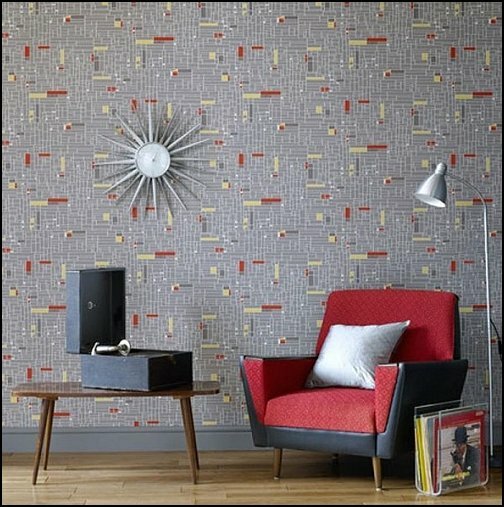 For any mid-century modern fan, Grid combines 1950s graphic print influences with a watercolor palette of soft gray, coral and buttermilk in a fun retro print that was inspired by the classic Briitish ‘caf tables tops of the era. 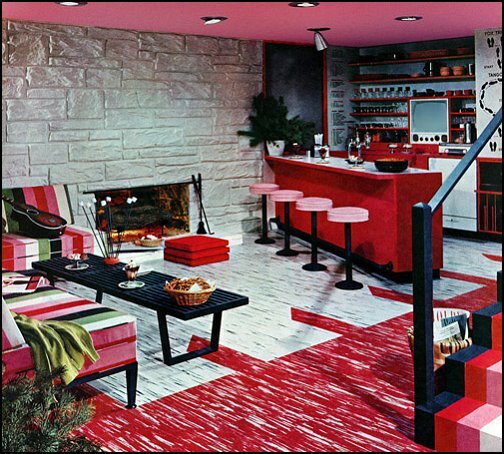 The tone for the 60s was already set by the end of the 50s.